Students may have seen him walking around Cal Poly wearing a beret and speaking with students on Dexter Lawn. 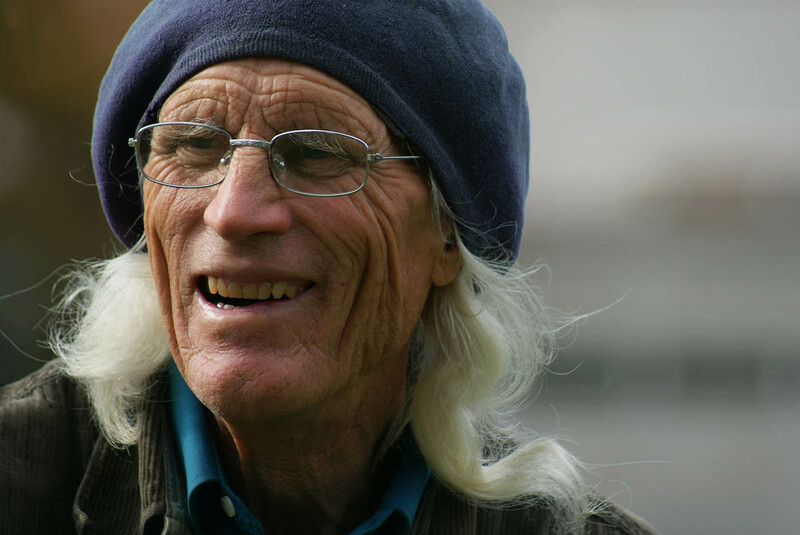 Seventy-one year-old Atascadero resident Eric Greening uses Cal Poly as a venue to tutor community members in humanities, social sciences and biology. Greening said he opposes the potential two-year closure of the Robert E. Kennedy Library. The views expressed in this column do not necessarily reflect those of Mustang News. What would our campus be like without a library for two years? This prospect looms not because of a natural disaster, but to accommodate a renovation we are told is needed. Before a decision is made that could lead to such an outcome, countless questions must be asked and not ignored. Has any other comparable university ever closed its library for two years? “Comparable” means one that, like Cal Poly, has one centralized library serving all departments, not one that, like UC Berkeley, has dozens. If any university has done this, we need a detailed report on the consequences. If not, how have all others managed to avoid this fate, despite the natural aging and evolution of buildings everywhere? The CSU five-year Facilities Renewal and Capital Improvement Plan gives two types of justification for the closure: inadequate study space and natural cooling, and that libraries must change in the digital age. Wayne Montgomery was our last old-school head librarian: a dedicated and effective gatherer and steward of a significant trove of research material. It is argued that change is required because circulation of library materials has significantly dropped. But one wonders to what extent this is a result of, rather than a valid excuse for, the unrelenting erosion of available collections, the unrelenting dismantlement of bookshelves and the unrelenting conversion of space from collections to offices, classrooms and areas for students to use laptops. Have academic libraries that have resisted such changes also resisted plummeting circulation? Why can’t Kennedy Library be, first and foremost, dedicated to what only a library can do, and why can’t our Master Plan process be tasked with providing for the space needs elsewhere on campus, of functions currently encroaching on those unique to a library? Can better cross-ventilation be provided, a floor at a time, by converting inward-facing windows to accommodate transoms? This, and other fixes, should not be beyond the capacity of our world-class architecture department; why not offer them the challenge? Were this two-year closure to take place, how many employees would be out of work for the duration? How many would be permanently lost as economic necessity forces them to take positions elsewhere? Where, exactly, on campus would the classroom, office and study space uses currently accommodated in the library be relocated? How are all such locations currently being used, and where and how would those uses continue? Are physical changes to those relocation spaces needed, and, if so, does the $50 million price tag of the renovation cover such changes? If the funding must come from elsewhere, exactly what would be sacrificed? How far in advance of any library closure must preparation of alternate spaces begin? How would the closure affect the stated goal of increasing campus diversity? What prospective students would be deterred from attending by the prospect of no library during much of their time here? Would those laser-focused on a straight-line path to a lucrative career be undeterred, while those with a wide-ranging curiosity and a readiness to evolve in unexpected directions— in other words, the most open-minded prospective students— stay away? How would this affect the campus climate? Is there any way project funding could be redirected to restoring and updating the collections and restoring lost bookshelves, while retaining ample study space for those actively consulting the collections? Could some of it be used to create needed study space elsewhere on campus for those not using library resources? Has the Administration at all levels become excessively focused on capital projects when the most vital ongoing needs are operational? What public process, if any, will precede the final decision on whether to go forward with the closure? Yes, there was some public outreach about renovation design, but none that dug into the questions above or allowed for exploration of alternatives to the closure. It is imperative that a Learn by Doing university not teach, by example, hasty, sloppy decision-making that ignores so many relevant questions and the information efforts to answer them might provide. No decision to move forward with this closure should be made until the entire campus community has ample opportunity to debate, and weigh in on, full consideration of the questions above and many more.